The Firemen’s Home is a skilled-nursing home that is available to all of New York’s volunteer firefighters. Jerry Owenburg of West Babylon, 48, has been elected as the VP of the Board of Trustees of the FASNY Firemen’s Home. Long Island, NY - January 8, 2019 - Jerry Owenburg, a 48-year veteran of the fire service, has been elected as the Vice President of the Board of Trustees of the Firemen's Association of the State of New York (FASNY) Firemen’s Home. The Firemen’s Home, located in Hudson, New York, traces its roots back to 1892 and operates as a high quality, skilled-nursing home that is available to all of New York’s volunteer firefighters. Owenburg was re-elected to the board at the annual FASNY Convention which was hosted in Liverpool, NY. He was recently elected as Vice President of the board, starting this new position on January 1. 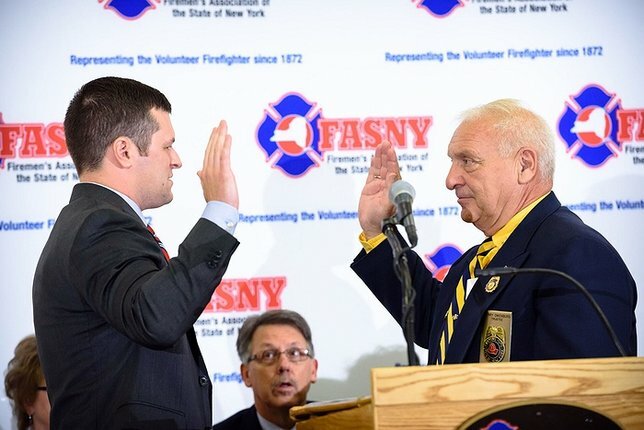 The Board of Trustees is a group of FASNY members who look over the operation of the Firemen’s Home, ensuring the great care for aging volunteer firefighters from across the State of New York. There are currently 70 retired firefighters and Ladies’ Auxiliary members living full-time in the Firemen’s home, and seeking care. Owenburg joined the West Babylon Fire Department in 1970 at 20 years old. He joined his father-in-law’s fire company, Rainbow Hose Co. 1, and served as Lieutenant in 1973. In 1974 he moved to Mastic, where he joined the Mastic Fire Department. He served with the Mastic FD for six years, serving as second Lieutenant in 1978, before moving back to West Babylon where he rejoined the West Babylon FD. He then rose up the ranks in West Babylon from Chief Driver, Lieutenant, Captain and now Treasurer of Rainbow Hose Co. 1. In 1992 he became the Third Assistant Chief and then Chief of Department in 1998. In addition, Owenburg is a member of the West Babylon Rescue Squad as an EMT for 10 years. A member of FASNY, he began with the Communications Committee and then moved to the EMS Committee. He has organized the Long Island Day at the FASNY Firemen's Home for the past twelve years, where Suffolk County and Nassau County come together to visit and honor their fellow firefighters. He worked for the Town of Babylon Highway Department for 32 years, from a laborer to a General Supervisor. Owenburg is married to his wife Ellen of 48 years and they have three children Jerry Jr., Shawn and Jennifer. They also have seven grandchildren; Andrew, Emily, Connor, Meghan, Jack, Abigail and Emma. Founded in 1872, the Firemen’s Association of the State of New York (FASNY) represents the interests of 110,000 volunteer firefighters and emergency medical personnel in New York State. For more information, visit www.fasny.com. Subject: LongIsland.com - Your Name sent you Article details of "Jerry Owenburg of West Babylon Elected Vice President of The Board of Trustees for the FASNY Firemen’s Home"